This webpage explains how to evaluate the capacity factor and the production from hydro plants. The resource can be computed from the electricity power equation that multiplies the water flow by the head by the gravity constant and by the efficiency.As with the solar and wind pages, the hydro page begins with hydro resource analysis. Hydro projects can have higher volatility than other projects, but the flows experience mean reversion. Hydro projects also have longer lives than other projects meaning that re-financing can be an important issue. 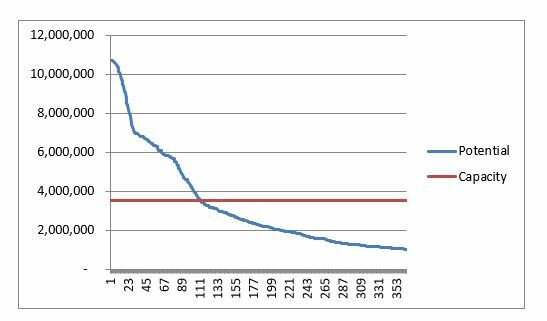 In the resource analysis on this page you are guided through a hypothetical run of the river plant that applies flow rate data. 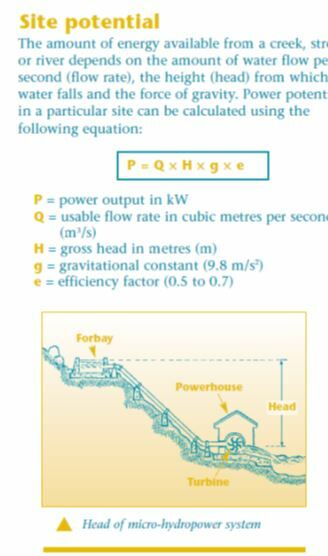 You apply the hydro power data where kW produced is a function of the flow rate, the head, the gravity coefficient and the efficiency of the plant. After working through the resource analysis, a financial exercise is included that demonstrates the importance of re-financing and measuring the cost of capital. In addition there is a discussion of simulating storage hydro for systems that have reservoirs. As with wind and solar, I have put together the database of actual plants in order to evaluate the variation in production from plants. This data comes from the a US EIA database that tracks month by month generation (I understand that S&P tracks the data and charges you something like 50K USD). In another page I explain in detail how you can update the database. The hydro database includes three pages — one for the data from EIA and two other pages that put together analysis for individual plants. As with any other excel stuff, I mainly use INDEX, MATCH and SUMIF to make all of the analysis. You can download the database by clicking on the button below. Below the button I have put a couple of screenshots that illustrate the summary analysis and the analysis for a single project. Computing P90, P75, P50 etc. from Water Flow P90, P95, etc.